The 2016 Victorian winter has seen high rainfalls occurring, resulting in swollen rivers, flooding, full dams, grass growth and …….mosquitoes! 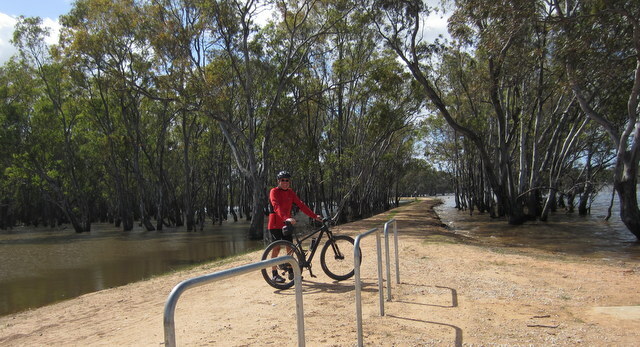 The O’Keefe Rail Trail has not escaped the impact of this, especially where the trail crosses Lake Eppalock at Derrinal. 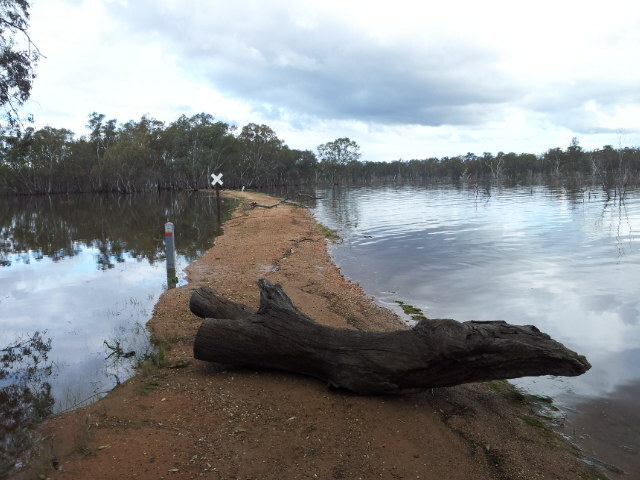 The recently completed 30km extension of the trail involved the construction of a one kilometre raised causeway across the dry bed of the then low level Lake Eppalock reservoir. The trail now follows the original pre reservoir railway alignment, with the design allowing for flooding of the trail once the lake exceeds 100% capacity. With the lake reaching a capacity of 101.7% full in late Sept/early October, all signs of the trail’s lake crossing were ‘lost’ except for the 90m Mt Ida Creek trail bridge, with the water level flooding the trail. For three weeks, this section of the trail was closed to the public. Now re opened, with some damage to the trail surface apparent, signs warn trail users to enter the section with caution. The current experience, while on the trail, is spectacular! Walking or riding, on what appears to be a narrow piece of land stretching across the expanse of water, has waves lapping the trail!